New daily ‘Top 10 tournaments’ which reward the top-10 finishers with an equal 10% share of the prize-pool, regardless of their chip-count (no final table) – this aims to ‘reduce variance for players while allowing more of them to experience a big cash‘. Winning Poker Network rooms (e.g. Americas Cardroom, Black Chip Poker, SuperStack Poker, Ya Poker), all follow the same daily tournament schedule. 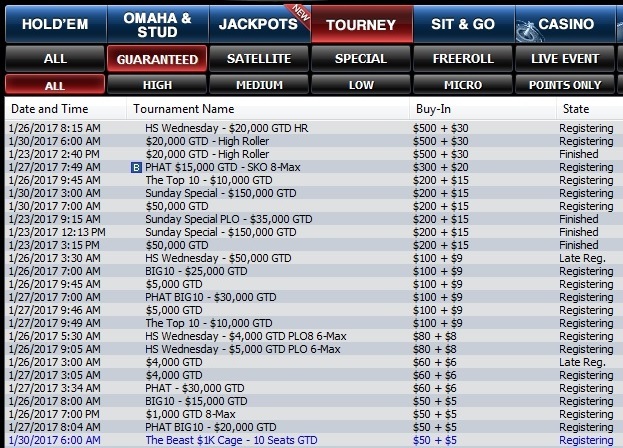 There’s a guaranteed tournament starting every 30 mins from 2:30pm ET to midnight. Winning Poker Network hosts on-demand freeroll tournaments which start as soon as 270 players sit down. Unlike other poker rooms, WPN has a freerolls leaderboard and rewards top performers with extra prizes, like free entries into regular tournaments. First place winner in each month’s freeroll leaderboard gets a free seat into the Winning Poker Network’s Sunday $215 event. The Winning Poker Network’s flagship event is the Million Dollar Sunday, which happens a few times a year. The largest GTD tournament open to the USA, first place receives at least $200,000.